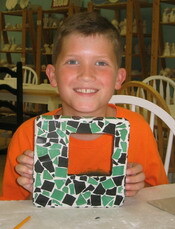 Come join in the fun and learn the art of mosaics! First-timers and long-time hobbyists have a blast with this simple puzzling art! We have dozens of wooden shapes to mosaics on, and you can mosaic onto many of our pottery pieces as well. Quiggly's offers a wide range of materials, grouts and adhesives to make your project look great! Glueing & grouting is a simple process to mosaic just about anything. We supply you with all basic tools and materials to mosaic with... all you need is a good dose of inspiration (we have that too)! Prices vary from $14-$50, the average is $20 or less. This fun craft is easy to do and you can take it home that day. First, you browse and select a wooden plaque. Using our colorful papers, you may decoupage or paint the surface and then add items to your form such as bling, old jewelry, stickers, beads, special shaped tiles, and more! Before you know it you have created a one-of-a-kind cool piece of art!